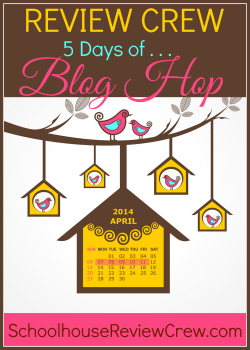 It’s Day 3 of our 5 Days of Charlotte Mason Preschool blog hop! 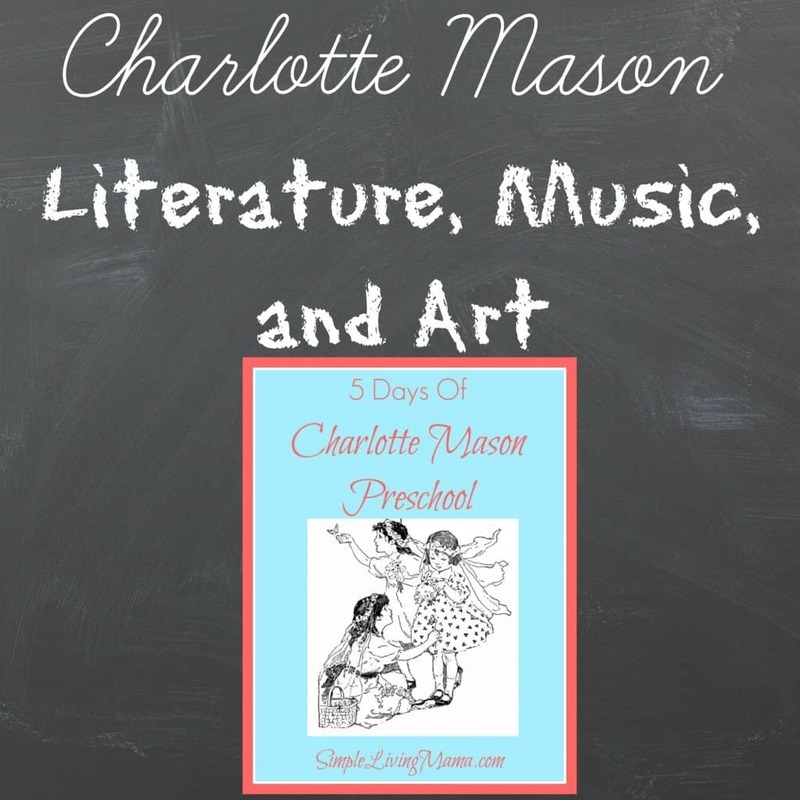 I’m very excited to talk about a few of my favorite subjects, literature, music, and art and how we incorporate them into our Charlotte Mason preschool. 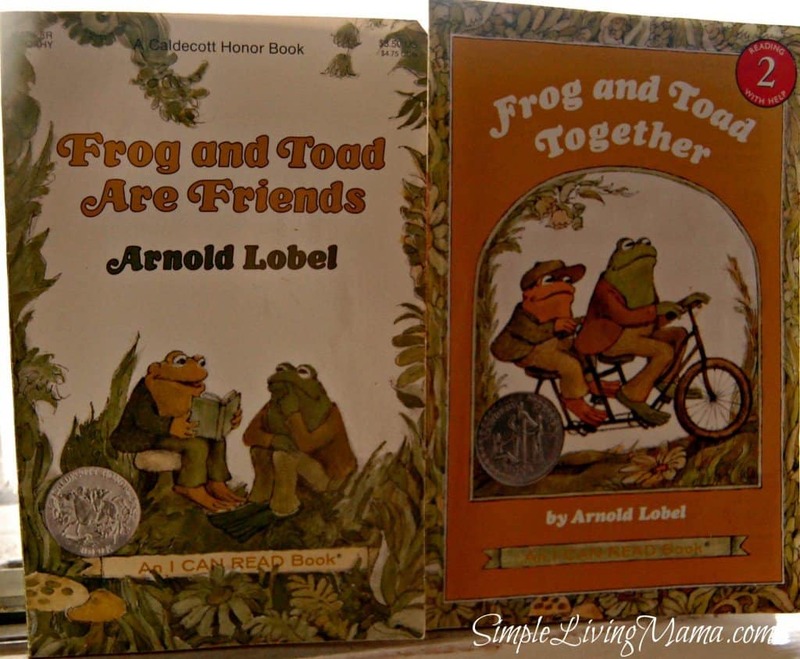 You will also find my Charlotte Mason preschool book list incredibly helpful! One of the things that appealed to me about the Charlotte Mason method was the emphasis on “living books.” Living books are good books marked by high literary quality and they communicate knowledge. 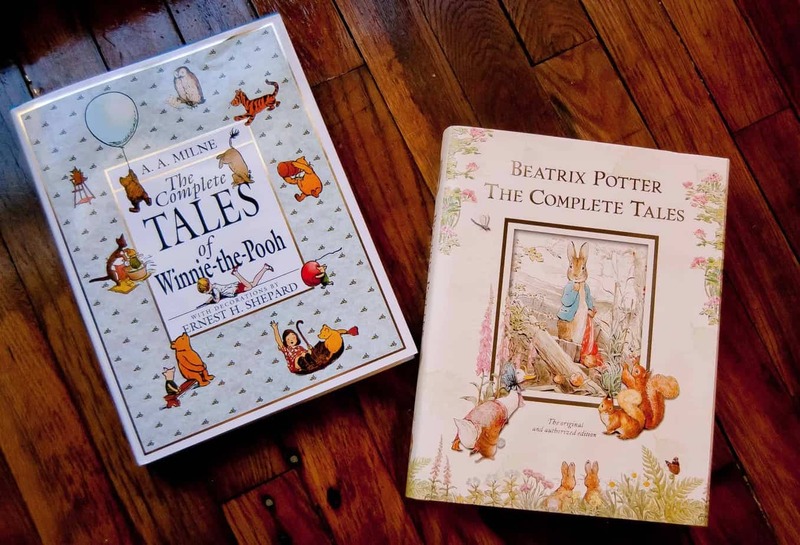 Most children learn about subjects in school with boring, dry textbooks.Children who are taught with the Charlotte Mason method learn through adventurous fiction books, as well as excellent nonfiction such as biographies and texts on nature, geography, and science! I read aloud to my children often. We read at least one book a day, and often much more than that. We read Scripture from the Bible, as well as from a children’s storybook Bible. We read poetry and good children’s books! This is the time to introduce ideas and get your children accustomed to reading. Just read to them! There are a few book lists here on the blog. I have a toddler book list, a preschool book list, and a family read-aloud chapter book list. 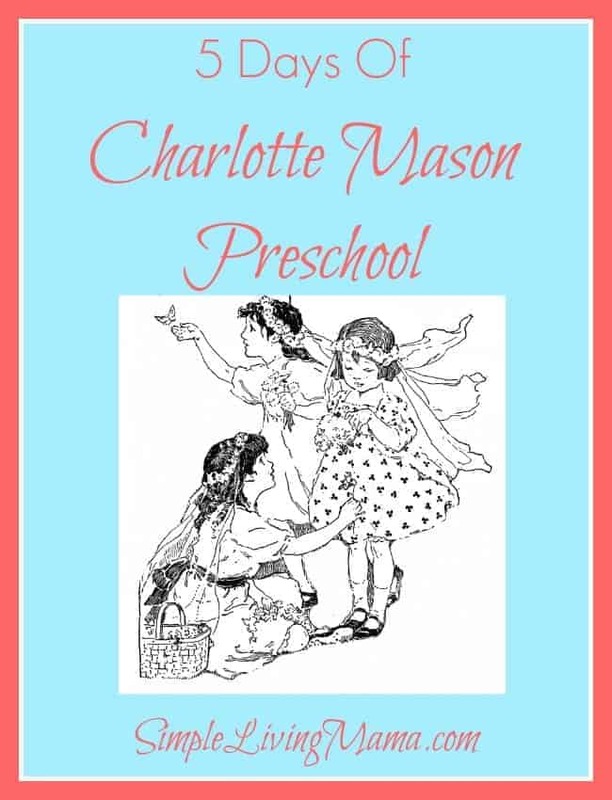 For this post I have decided to make a Charlotte Mason Inspired Preschool Book List that you can print and keep in your homeschooling binder. This list is not exhaustive, but it includes most of our favorite books for the preschool years! Subscribers to my weekly newsletter get access to this book list! I am going to briefly touch on the subjects of music and art. Picture study and composer study are part of a Charlotte Mason education. The preschool years are the perfect time to introduce these subjects. It’s very easy to do. Simply display a work of art for your children. You can tell them the artist and even talk about it a bit if you wish. You do not need to do anything formal right now. Just get your children in the habit of recognizing beauty. Do the same with music. You can play classical music in the background while your children play. Begin to introduce hymns and folk songs. Children love music! You can read a little bit more about how to introduce music and art to your preschoolers, as well as poetry and handicrafts at Simply Charlotte Mason. Need help planning your own homeschool preschool curriculum? My Homeschool Preschool Planner can help! Please check out what some of the other Crew are blogging about! Ellen @ Grace Tells Another Story ~ Making Homeschooling Fun! You have pictures of some of our favourite books. I’ve just pinned your preschool book list. Thank you. Wonderful books, Joanie! You have lots of our early favorites on your lists! 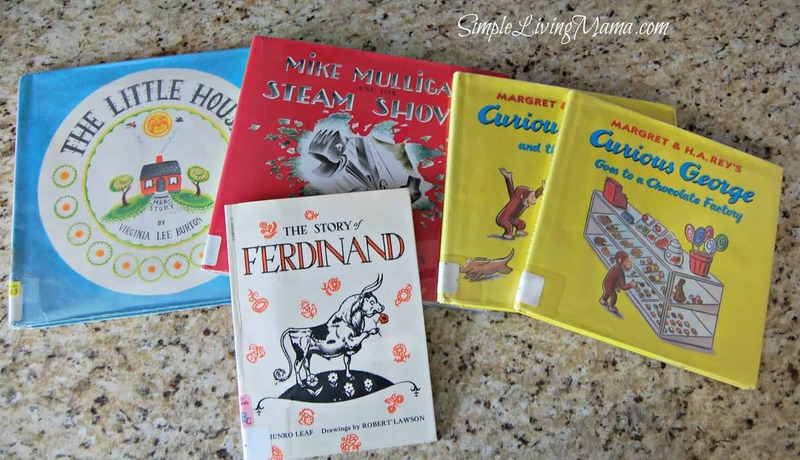 I wanted to share a couple other faves with you; “Herbert the Lion” and Rosemary Wells’ McDuff books. Both are charming and definitely non-twaddle!